JUBA, Jul 9 2012 (IPS) - One year after the formation of South Sudan, the country’s women say that independence has not resulted in the positive political, economic and social changes that they had hoped for. Women activists worry that even after separation from Sudan on Jul. 9, 2011, when South Sudan became the world’s newest country and Africa’s 54th nation, the government has not done enough to improve the lives of its women. But as people across the country celebrate the first anniversary of independence from Sudan, after a 21-year civil war, the year has been fraught with crises. The country is in the midst of an economic crisis after South Sudan’s decision in January to shut down oil production, which accounts for 98 percent of the its revenue, following a dispute with Sudan over fees charged to use its pipelines. There is also dire food insecurity here. In June, the United Nations World Food Programme said that more than half of the country’s 8.2 million people would need food aid by the end of the year. In the country’s Upper Nile state, the Jamam refugee camp is on the verge of a humanitarian crisis. The camp is home to some of the 200,000 refugees who, according to the U.N., have fled the conflict in Sudan’s Blue state. However, Médecins Sans Frontières has warned that the mortality rate among children at the camp was 2.8 per 10,000 per day. This figure is above the emergency threshold of two per 10,000. Amidst all of this both women leaders and activists admit that they had high expectations of the country’s first year. Some feel that the reality of independence has failed to live up to the hype and euphoria. “We had high expectations, but I think they are not unrealistic and should not be pushed aside. Women are doing badly politically, economically, socially and education wise. The government needs to take measures to address the challenges facing women so that they can truly enjoy life in their new independent country,” Lorna Merekaje, of the South Sudan Domestic Election Monitoring and Observation Programme, told IPS. The Central Equatoria state Governor’s advisor on conflict resolution, Helen Murshali Boro, said that women’s concerns would be addressed. “There is freedom of speech to allow women to express themselves and this means women’s concerns will not go off the radar until they are addressed in the coming years of our country’s independence,” she said. Though the reality still remains far different. “Like in the past when South Sudan was still part of Sudan, today women live in poverty,” said Lona James Elia, executive director of a local women’s rights agency, Voice For Change. The National Baseline Household Survey (NBHS), conducted in 2009 and released in June 2012, indicates that over half of South Sudan’s 8.2 million people live below the poverty line on less than a dollar a day. The majority of the poor are women. Elia added that South Sudan is still unable to provide maternal health services to the country’s women, especially in rural areas. According to the U.N. Children’s Fund only 19 percent of births are attended by a skilled health worker. According to the NBHS, 30 percent of the population has no access to basic health services. The few available health facilities lack supplies and qualified personnel to provide the required services. And in some rural areas women cannot receive maternal and antenatal care because they live too far from the nearest maternity clinic. Thirty-seven percent of poor households have to travel for more than an hour to reach their nearest most-used health facility, according to the NBHS. “Women are still dying while giving birth. They are still not accessing maternal health services. A woman is not supposed to die because she is giving birth to a new life, a new baby. This is not acceptable,” Elia told IPS. According to the National Bureau of Statistics, in 2011 the country recorded that 2,054 out of every 100,000 women died during childbirth. The high mortality rate has not changed much a year later, according to the U.N. Population Fund (UNFPA). 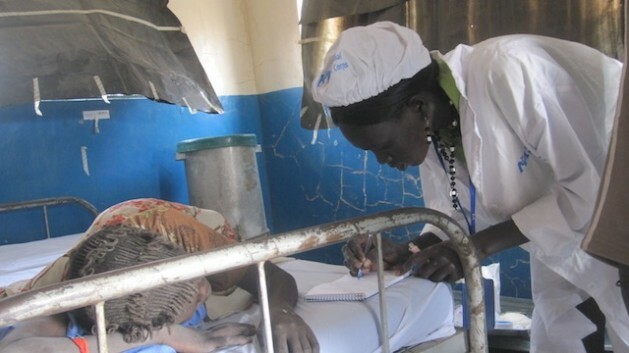 In June, Kate Gilmore, assistant secretary-general and deputy executive director (Programme) of the UNFPA, told reporters in Juba that maternal mortality rates in South Sudan remained the worst in the world. “The latest evidence that we have is that using standard figures in every 100,000 births there are over two thousand women who die from preventable causes in South Sudan. In Afghanistan, which surely is one of the most troubled countries in the world, it is half that. Across Africa it is five hundred,” she had said. Elia said the government needed to invest in maternal health services to ensure that women could participate in developing the country. “A mother should not have to travel all the way from Gondokoro to Juba to deliver a baby because there is no hospital in her home city,” Elia said. Gondokoro is about 20 km from Juba and also within Central Equatoria state. She added that because the nearest health care centre was too far, some women died along the way. However, government spokesman Barnaba Marial Benjamin said that the government had worked hard to improve living standards. “We have initiated projects, including building schools and health centres, which will benefit all South Sudanese citizens, including women,” he told IPS. In addition, the government has implement an affirmative action policy that ensures 25 percent women’s representation in all government jobs at national, state and county levels. “You see after independence the president appointed six women to the cabinet and about nine to 10 assistant ministers. I think with about 16 women in the national government, the government has responded positively,” said Boro. Currently there are four female ministers out of a total of 29, and eight female assistant ministers from a total of 27. However, activists say that this has not directly affected the lives of the country’s women. “When you look at the middle-class women and those at the grassroots they are still not in positions where they can make decisions that benefit women,” Merekaje told IPS. Boro admitted that women still occupy low entry positions in the work field. “Although these days you see more women coming to work in the morning, at the end of the day they go home with peanuts because they work in the less-paid, low positions,” Boro said. Elia said that women were unable to find employment because the majority are illiterate and do not have the vocational skills required by employers. According to the National Bureau of Statistics, 88 percent of South Sudanese women are illiterate. In addition, the U.N. says that only one percent of girls complete primary school. “Women are the most illiterate and because, despite the independence of our country, women at the grassroots level still remain the most underprivileged segment of society as they have to depend on men for survival,” Elia told IPS. Jerisa Yide is one such example. The 65-year-old grandmother earns a living breaking stones and rocks into gravel, which she sells to builders. “I used to crash stones before independence to enable me to pay my grandchildren’s school fees. We are now independent, but we are even paying more fees for our children to go to school,” said Yide. Primary and secondary school education are not free in South Sudan. And as a result of the shut down on oil production, the government introduced an austerity budget in January where it scrapped free university education. Yide said that when she voted for independence she expected the government to provide better services, including education and health. Selina Modong agreed that not much had changed. She said that the cost of living in Juba had increased since independence. As a result of the economic crisis, inflation has soared to a staggering 80 percent in May. “I was eating one meal per day before independence. Today I still eat one meal per day and sometimes we hardly eat good food these days,” Modong said. “I think independence has not changed anything for us poor people,” Modong concluded. Elia said that everyone should participate in ensuring that the women’s agenda is addressed. “If you want this independence to benefit everyone, the issue of women should not be for women alone. It should be for everybody. Let us ensure that our daughters have a bright future. That they will get the education they want, that they will get the employment they want and that they will get the health services they deserve to build healthy families for themselves,” said Elia.